ST. PETERSBURG, Fla. (AP) — Blake Snell’s arm was on. Chris Iannetta’s foot was a little off. That was more than enough for the Tampa Bay Rays on Tuesday night in a 4-0 win over the Colorado Rockies. 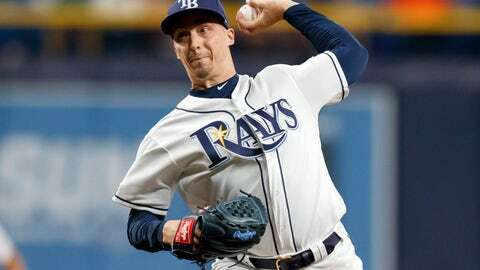 Snell matched a career high with 13 strikeouts, pitching seven innings of two-hit ball to lift the Rays to their fifth straight win. The AL Cy Young Award winner struck out six straight during one stretch, helping Tampa Bay improve to a franchise-best 5-1. Snell (1-1) rebounded splendidly after allowing five runs in an opening day loss to Houston. Tampa Bay scored three runs in the first inning against Kyle Freeland (1-1), an effort aided by Iannetta’s error. With the bases loaded and one out, Mike Zunino hit a chopper to third baseman Nolan Arenado, who threw to the plate for a forceout. A replay review showed Iannetta lifted his foot off the plate before catching the ball, allowing Yandy Diaz to score. Guillermo Heredia followed with a two-run single. Even in the first inning, three runs looked like a lot for the Rockies to overcome. Christian Arroyo’s two-out single off reliever Carlos Estevez made it 4-0 in the sixth. Freeland lost for the first time in 12 starts since last Aug. 1. He tied his career high with 10 strikeouts in 4 2/3 innings. He gave up three hits and four walks. The Rays have given up no more than one run each of their last four games, two games each against Houston and Colorado. It is the second time in franchise history they went four straight games without giving up two runs. They did it in September 2000 against Toronto (two games) and the New York Yankees. Rockies: 1B Daniel Murphy (fractured left index finger) probably will be sidelined for at least a month. He was added to the 10-day injured list Monday. LHP Jake McGee (sprained left knee) joined him on the 10-day IL on Tuesday. Rays: INF Daniel Robertson left the game in the second inning with a stomach illness. … Diaz came up limping running out a double in the eighth and left the game with an ankle injury. RHP German Marquez, a former Rays prospect who was traded in January of 2016, will pitch the series finale for the Rockies on Wednesday against RHP Charlie Morton.